Do you love to bake but sometimes just don’t have the time? Work commitments keep eating into your free time? Say hello to Bakedin Baking Club. I subscribed to the Bakedin Baking Club a while ago and have to say the recipes just keep getting better. Just when you think they’ve peaked with how delicious a recipe can be, they bring out the next one and it’s another “Wow Factor” one! Every month you receive a wonderful box full of all the dry ingredients you need to bake a recipe created exclusively by Michel Roux. You also receive extras needed such as baking paper, skewers, etc. You just need to provide the eggs and any chilled ingredients. This might just look like 6 ingredients but it’s not. Different ingredients that go in to the recipe at the same time are packaged together in one bag for convenience, all of them weighed out exactly for you. Only top quality ingredients are used too. You don’t have to spend ages weighing everything out, which is great when you are short of time. All of this costs just £7.99 a month which includes delivery so it is fantastic value for money. The recipe card is clear and easy to follow and all the measurements of the dry ingredients are listed so you can make the recipe again any time you fancy. 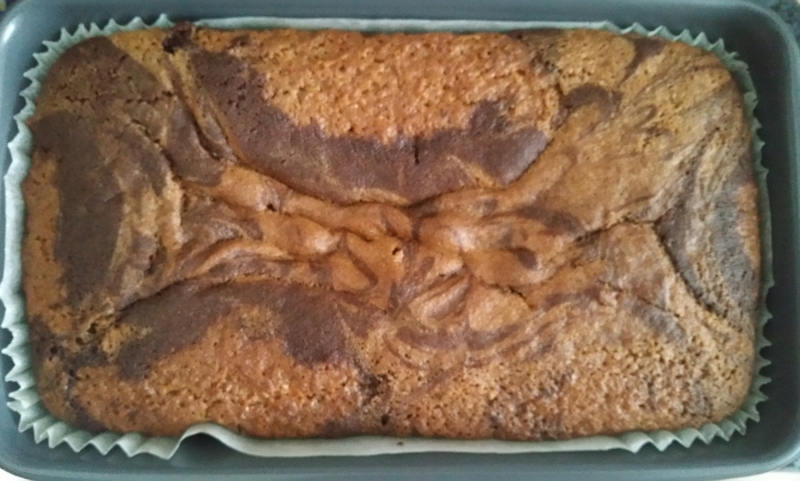 I love marble cakes. The different colours and flavours really appeal to me, so I was very excited to get this Marble Loaf in the oven! The recipe said to line the loaf tin with the baking paper provided, but I have a huge supply of loaf tin liners so I decided to use one of those instead. I followed the rest of the recipe to the letter though. 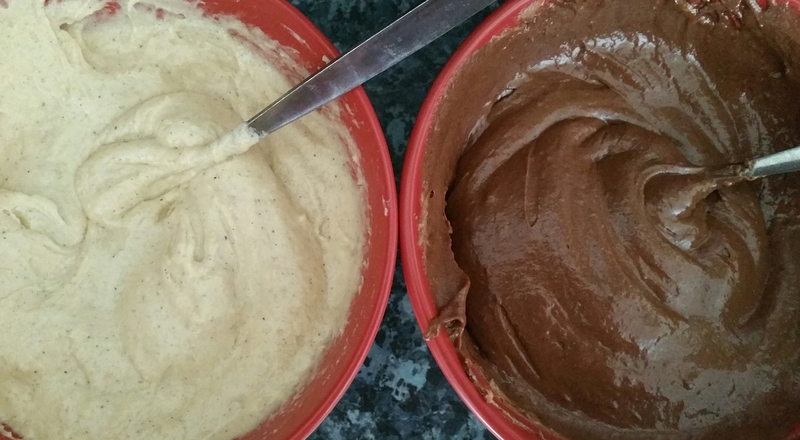 The vanilla and chocolate aromas from each bowl made my mouth water. Just look at all the flecks of ground vanilla in there! Yum! The next part was to make the chocolate glaze topping, melt the white chocolate using their brilliant chocolate melting method, and make the feathered design on the top. They had provided skewers to test the loaf was ready, to swirl the mixtures, and to make the effect on top. Perfect! Every recipe card has a Top Tip from Michel Roux on a way to enhance the recipe even more. The tip with this one was how to make a hot chocolate using any leftover chocolate topping. As you can see in the main picture, I did that, and it was scrumptious! 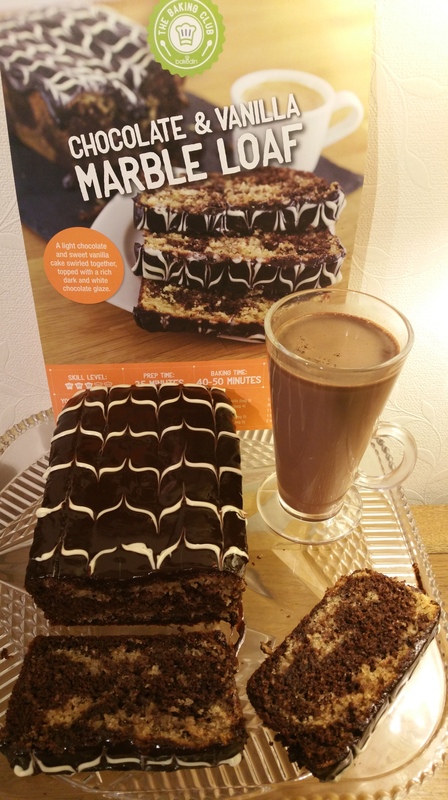 The Marble Loaf went down really well in our house and with some Mums at my son’s school, who I gave some to. I will definitely be making this again and again, and making sure I have extra topping for more hot chocolate!!! 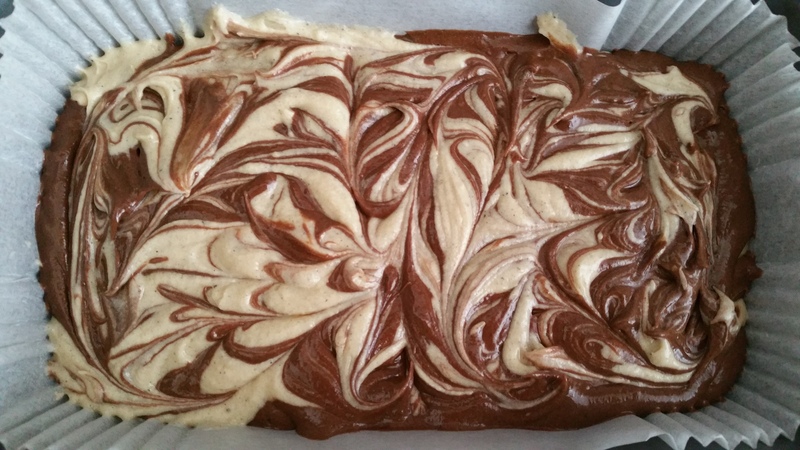 Bakedin Baking Club is perfect for beginners and for more experienced bakers alike. The recipes are exclusive and the numbered packages of ingredients make them super-convenient and easy to follow. They are also ideal to make with children, as the recipe includes clear photographs of each stage. Perfect for quality fun time with the family. 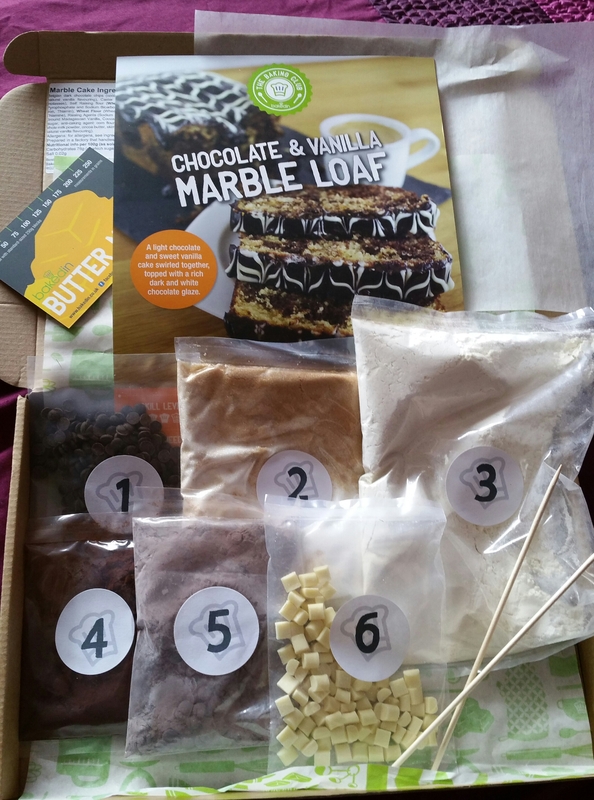 If you are tempted to try a Bakedin Baking Club recipe box for yourself, click HERE and you will receive your first one for just £1.99! That doesn’t even cover their postage to send it! You will receive your first box within a few days of ordering it so you don’t have to wait weeks like you do with some other subscription boxes. You can cancel at any time, although I know you won’t want to once you’ve tried your first one. Happy Baking! DISCLAIMER: I pay for my subscription and have not been asked to write a review. I just love to promote fantastic products and services and this is definitely in that category! All views and opinions are my own honest thoughts.